and another $3000 has been gifted by the Freemasons’ charity, Masonicare. The generosity of Hastings Macleay Freemasons has again ensured a special trust established to support the families of young cancer patients has the funds it needs for another 12 months. 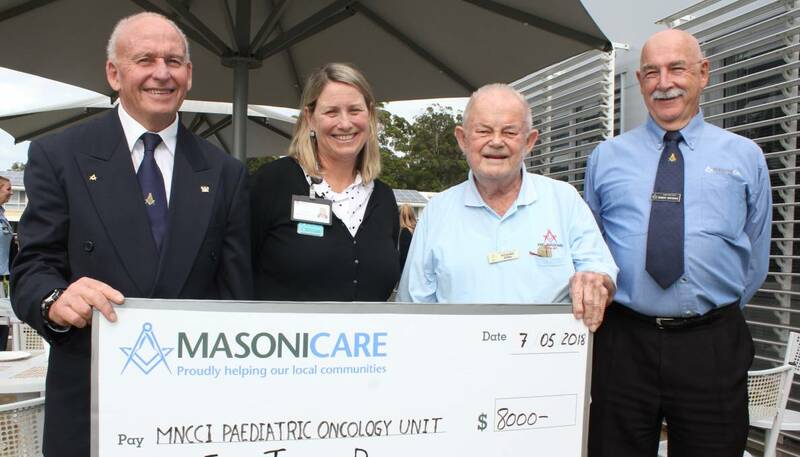 The Hastings Macleay Freemasons Association has donated $5000 to the Mid North Coast Cancer Institute, and another $3000 has been gifted by the Freemasons’ charity, Masonicare. This brings the total donated by the Freemasons to the cancer unit’s support service since 2012 to $58,000. Nursing Unit Manager Jenny Baroutis said the Freemasons personified service to others. “The Freemasons return to the cancer centre each year to ensure there is financial support for families of children with a cancer diagnosis. These families have a lot on their mind during what can be a very difficult and stressful time. For those facing financial hardship as well, the support of the masons is a huge relief. “We can’t thank the Freemasons enough for their ongoing generosity. It makes a world of difference to young cancer patients and their families,” Ms Baroutis said. Hastings Macleay Freemasons Association spokesman Ray Posner thanked Masonicare and the Lodges involved – Lodge Star of Wauchope, Lachlan Macquarie, Port Macquarie Daylight, Laurieton, Loftus-Macleay and Trial Bay Daylight.